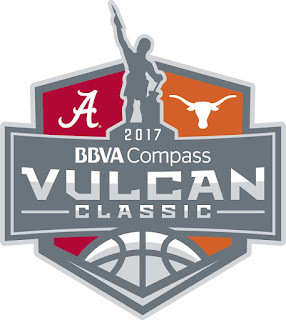 Alabama will play its final game before conference play begins when they host the Texas Longhorns on Friday in the third annual Vulcan Classic at Legacy Arena in Birmingham. Alabama will be seeking its first win in the event. Game time is 8 P.M. CT. It will be televised on ESPN2. Click the links for team and KenPom stats. My Two Cents: Both teams enter this game needing a quality non-conference win. Texas has good wins over Butler and VCU, but had near-misses to Duke, Gonzaga and Michigan. Alabama meanwhile has also challenged itself, with a good win over Rhode Island, and potentially good wins over BYU and UT-Arlington, assuming those teams do well in their respective conferences. Both teams enter 8-3, but both have looked shaky at times. Neither team has a win over a program considered a tournament lock, but both teams are expected to be in the tournament mix. This could be a game that looms large on Selection Sunday. Texas is not expected to have their top guard and lead scorer Andrew Jones on the floor Friday night; he's currently out with a wrist injury. His absence has been felt. Texas lost a home game to Michigan, and struggled to beat Tennessee State in their last game, prevailing 47-46. There's more than enough talent left on this Texas team to win on Friday, but our guys may be catching the Longhorns at the right time with Jones out. Players to Watch: I'm going to stick with Braxton Key. His return on Tuesday night is not going to make his highlight reel, but it was good to see him back on the floor. He played 20 minutes, but did not score a point, and turned the ball over three times. He did have 4 rebounds, 2 assists and 2 steals, but he just never looked comfortable in the game. I think it was merely rust for Braxton, and I expect him to play much better on Friday night. Five star freshman Mo Bamba has deservedly received plenty of attention. He's likely a lottery pick in June if he chooses to enter the NBA draft. But he's not the only big man on this Texas roster that is talented. 6'9, 245 lb forward Dylan Osetkowski is second on the team in points (15.2) and rebounds (7.5). Along with Bamba (10.3 ppg, 9.7 rpg, and an astounding 4.1 blocks per game), Texas has quite the formidable duo in the post. Second chance points and points in the paint could be at a premium for Bama with those two guys on the floor.